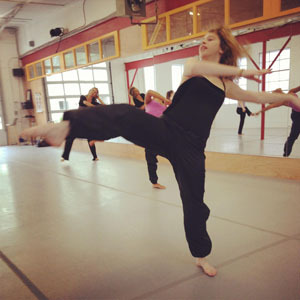 White River Ballet Academy – Located in WRJ Arts Hub! Located in WRJ Arts Hub! White River Junction is quickly becoming an hub of creative culture and we are pleased to be a part of it! From alternative fashion at Revolution (26 N. Main St., 802-295-6487), to the funky Main Street Museum (58 Bridge St., 802-356-2776). From the creative artist center of the Tip Tip Building, to the many alternative movement and therapy studios. From the Center for Cartoon Studies (94 S. Main St., 802-295-3319), to the edgy Tuckerbox Cafe, to the eclectic restaurants like Tip Top Cafe and Elixir, to the music staged at the area venues. And finally the best regional theater at Northern Stage (12 N. Main St., 802-296-7000)! White River Junction is the place to be for the Arts! Jackie has not only taught me ballet but also to do my best and try my hardest. I look forward to going to ballet classes every week. I also enjoy that at least once a year we have a performance. I think that helps me become a more confident dancer. I hope to dance with Jackie for many years. She is a fabulous teacher! Jackie is a wonderful and inspiring teacher and I really look forward to the classes each week. Learning something new is important to me, and not only do I learn at WRBA, I have a lot of fun too. Your students are fortunate that they have an enthusiastic and educated teacher that STAYS involved in what's current and safe for them! It has been a privilege having Jackie as a teacher over the years, not only for myself, but also for anyone else who has ever experienced one of her classes. She is a great teacher, and I always look forward to my next lesson with her, whether it's next week, a few months from now, or even next year!